The Art of Speech presents a dynamic path of practice leading to an experience of the Word as a living, healing and creative power. Helping to deliver Western intellectual speech from what Artaud described as "shrivelled throats" and "monstrous talking abstractions", Langman brings to life the spiritual realities out of which a true Art of Speech arises. Inspired by Rudolf Steiner and pioneered initially in the German language by Marie Steiner, this artform is illuminated here through the genius of the English language. Langman builds a bridge between mainstream research into the intrinsic nature of Speech, and the levels of spiritual cognition that led to Rudolf Steiner's insights. Speech and language can no longer be reduced to an arbitrary collection of abstract symbols, she asserts. This book will inspire those working with these disciplines as practitioners (both artistic and therapeutic) as well as those who wish to understand their significance in human evolution, both past and future. 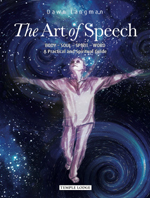 Following her first book The Art of Acting, this volume completes a foundation of understanding for an exploration - in the conclusion of Langman's trilogy - of an integrated art of speech and acting. Grounded in the spiritual reality of the human being, Langman presents a systematic methodology with which to explore Rudolf Steiner's Speech and Drama Course. DAWN LANGMAN undertook a mainstream speech and acting training in Australia, followed by seven years of performing and teaching at secondary and tertiary levels. Her quest for an integrated approach that includes the spiritual dimension led her to train with Maisie Jones at the London School of Speech Formation in the method developed by Rudolf and Marie Steiner. She then taught for ten years at Emerson College in Sussex. Following this, Dawn trained in Michael Chekhov's acting technique with Ted Pugh and Fern Sloan of the Actors Ensemble in New York. Returning to Australia, she founded the School of the Living Word, where for eight years she continued to research the integration of Speech Formation with Chekhov's technique. She currently teaches this methodology at the Drama Centre, Flinders University, South Australia. Dawn is the author of The Art of Acting (2014).